Advanced debugging ability with "Stop on Test"
QPHY-BroadR-Reach performs electrical compliance testing of the Physical Media Attachment (PMA) according to the BroadR-Reach and 100Base-T1 specifications. Detailed connection diagrams ensure the proper setup and provide information about the required test pattern for each test. Upon completion of the test session, results are automatically compiled into a comprehensive report including screenshots. To properly perform the Distortion test, the DUT (Device Under Test), disturbing sine wave, and oscilloscope all need to be synchronized. In practice this proves to be a difficult task since the DUT has a clock of 66 2/3 MHz and test equipment uses a 10 MHz reference clock. 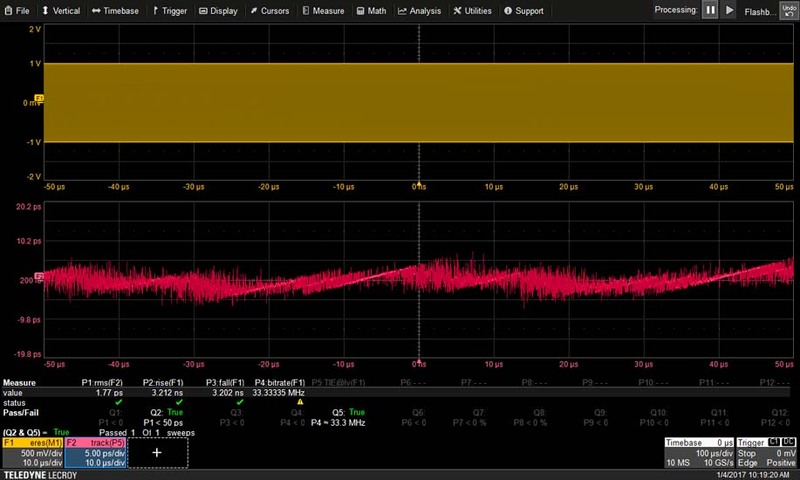 Teledyne LeCroy has developed a unique algorithm which performs software clock recovery on the Test Mode 4 signal, enabling the test to be completed without requiring a hardware frequency converter board. Teledyne LeCroy has worked with industry leaders to create the first physical layer test package for the BroadR-Reach. As active participants in OPEN Alliance Technical Committees our test solutions stay up-to-date on evolving test requirements. In addition to Automotive Ethernet, Teledyne LeCroy provides solutions for CAN, CAN FD, LIN, SENT, MOST, FlexRay, and more. Using the "Stop on Test" feature, the user can pause testing after each individual test and observe the results. 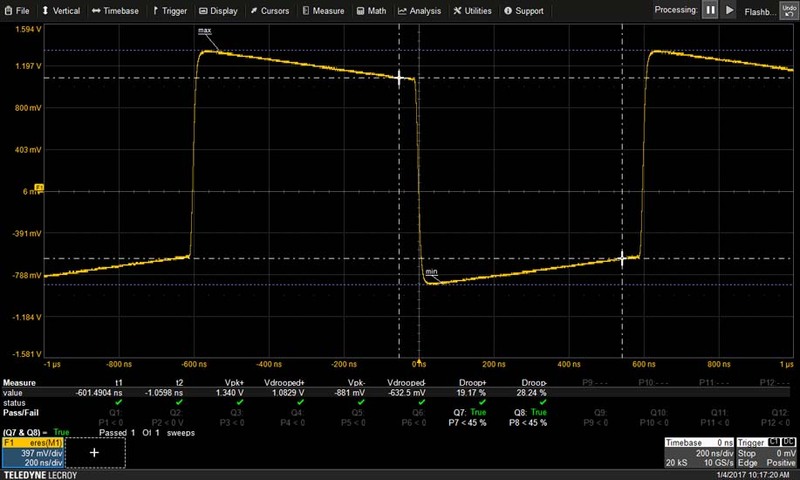 At that point, any of the oscilloscope's tools can be leveraged for further debug and upon completion, testing can be seamlessly resumed with a click of a button. The output droop is calculated on both the "+1" and "-1" symbols in the Test Mode 1 waveform. The magnitude of the droop is measured with respect to an initial peak value after the zero crossing (indicated by Max and Min parameters) and the value 500 ns after the initial peak value (indicated by the cursors). The peak distortion is determined by capturing output from the DUT while it is in Test Mode 4. The MATLAB script provided in the specification removes the disturbing sine wave and measures peak distortion at equally spaced phases of the symbol period. To pass, the script must report less than 15 mV distortion for 10 records. The Transmitter Master Jitter Timing and Transmit Clock Frequency are tested simultaneously while the DUT is in Test Mode 2. The Slave Jitter is measured by directly probing the DUT's TX_TCLK while the DUT is configured as a slave. The Power Spectrum Density (PSD) of the transmitter is tested against the specified limits defined by the mask while the DUT is transmitting Test Mode 5. 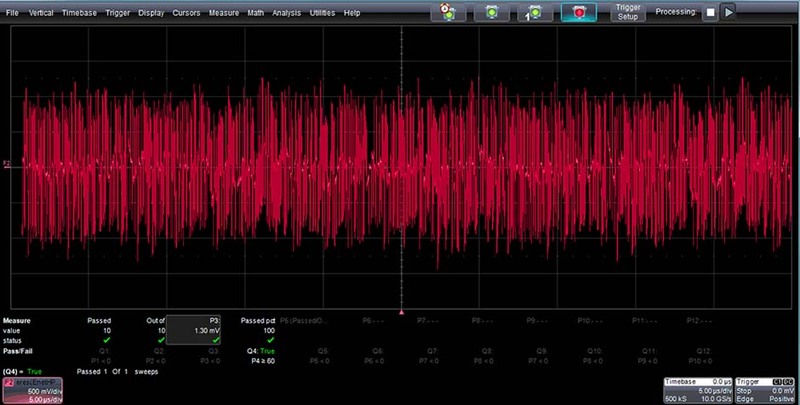 Using the oscilloscope for the PSD test removes the need to purchase a spectrum analyzer. 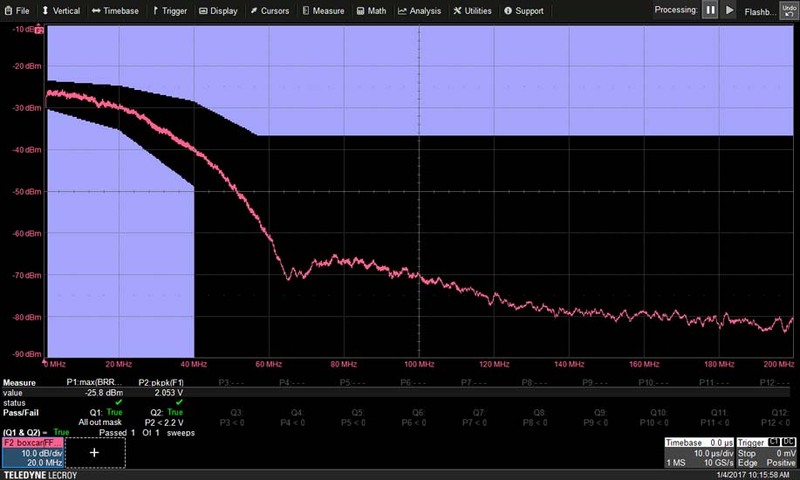 The Test Mode 5 waveform is also used to test the Peak Differential Output.